Alright, enough has been said about Kim's parting post, so I'm not about to debate about it any further. What needed to be said has been said. Despite the apparent division of opinions, the one thing that cannot be disputed is the commonality of food. For me, food is about bringing people together, not about tearing them apart. Hence, with all the negativity and anger from a few weeks ago, it is nice to see that something positive came of it. You see, it was suggested we have a chowdown of sorts. As a community of food bloggers, it has been a long time since a large group has come together. With the shear number of food blogs in Vancouver, it is practically impossible to organize an event with is inclusive. But for some of us, we felt the need to break bread and focus on our passion rather than our differences. Thus, Kevin was gracious enough to organize a dinner at Kalvin's Restaurant. 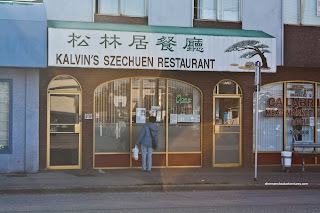 On its front awning, it advertises itself to be Szechaun restaurant; however, it is more Taiwanese with elements of Szechuan. The people in attendance were Ben & Suanne, Ed, Angie, Karl, Jessica, Anita, Russell and Diana. I must admit. Despite our differences, we still were able to come together for a meal. Life's short. Let's enjoy, not hate. For me, I was just happy to be there for the food. 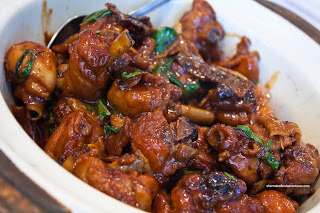 So we let Kevin do the ordering and we started with the Fondue Spicy Pork with Organ Stew. Alright, lemme get this out of the way... The menu names for these dishes have a lot to be desired. This dish was not a fondue. Rather, it was a heated hot pot of sorts with pig's blood and pig intestine. Due to these ingredients, the whole thing ended up to be quite gamy. For me, I grew up with offal and it ended up to be pretty good. I'm not sure everyone else had the same sentiment since it was one of the last dishes to be finished. 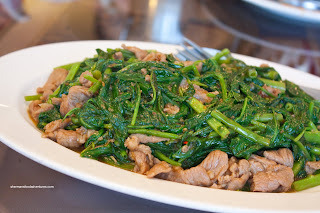 Next up was the Pork & Ton Choy in BBQ Sauce. 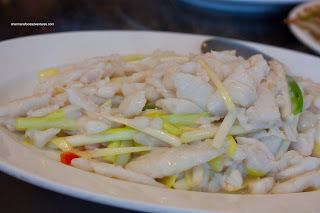 At first, I thought that there must've been some form of XO sauce used in the dish since it was a bit fishy and spicy. After checking with Kevin, it turned out to be satay sauce, which has some of the same ingredients as XO sauce, namely dried shrimp or sometimes, brill fish. For me, it was a truly different flavour with ton choy. I'm more familiar with the use of fermented tofu and garlic as a flavouring agent. As for the vegetable itself, it was cooked properly where it retained a nice crunch. 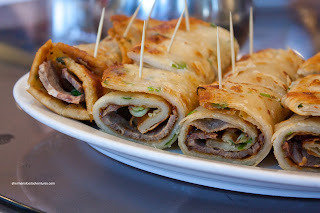 After this, we got a Shanghainese dish being the 5 Spice Beef in Onion Pancake. I thought that the beef itself was adequately seasoned where I could actually taste it. Usually, one complaint about this dish is that the beef gets lost. Not here. Furthermore, the amount of hoisin was just enough to add some sweetness. The onion pancake itself was also balanced in that the onions were not overwhelming. However, I would've liked to see it slightly thinner. I wasn't a big fan of the next dish which happened to be the Shredded Fish with Yellow Chives. I've had this before and I do realize it is intended to be mild. After all, flowering chives are not exactly a flavour explosion. Rather, it is all about the aromatics and texture. With that being said, I found the entire dish to be bland. Sure, I could taste the natural sweetness of the fish; yet little else. A dash more of salt would've done wonders. 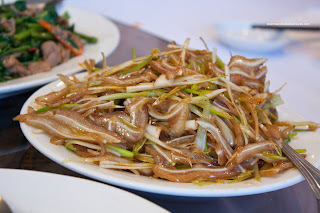 Whenever we dabble in Taiwanese food, there is sure to be offal. Case in point, the first hot pot consisting of intestine and blood. 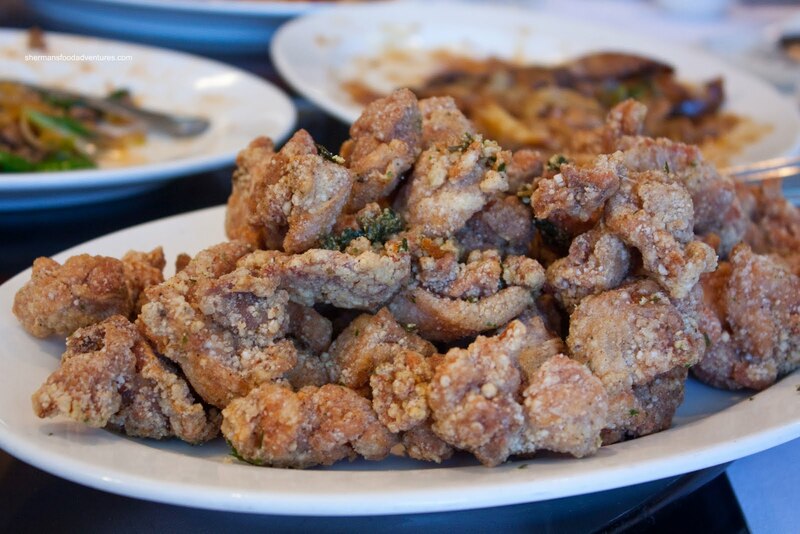 For our next dish, it was the classic Spicy Pig's Ear. This is mostly a textural item. When prepared correctly, it should be chewy while not too chewy. Think jellyfish. And much like jellyfish, there is no real inherent flavour (after rinsing and cooking) so the marinade is very important. This one was moderately spicy with a nice balance of sugar and soy. The flowering chives added another layer of texture and flavour. Hands down, the Red Fermented Pork Chops was my favourite dish. Just to note, the picture represents 3 orders. This is normally an appetizer; but since we had so many people, we needed much more than one order. Essentially boneless pork chops marinated in "nam yew" or fermented red tofu, this was a distinctively flavourful dish. 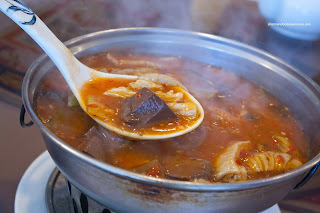 Normally, regular fermented tofu has a sharp saltiness which is enough to seasoned anything. The red version adds another layer of flavour which is typically sweeter and some spice. 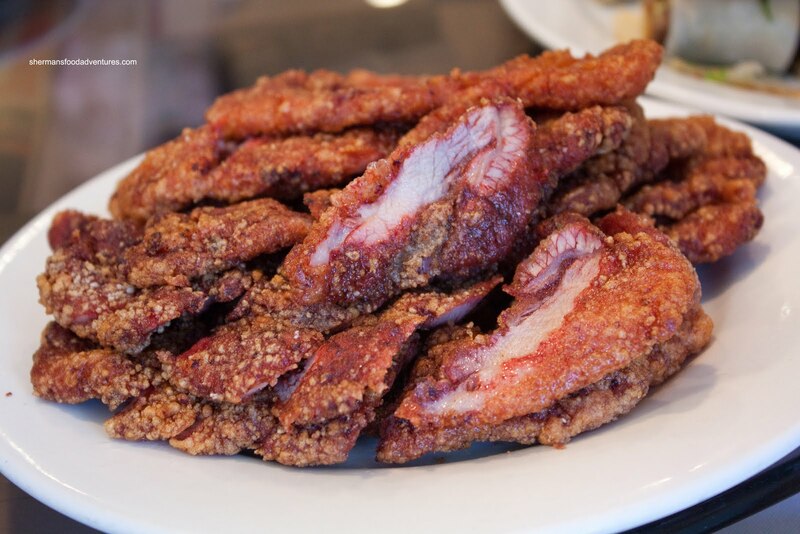 If you can imagine deep-frying this, it can only intensify the flavours even more. I really could literally keep eating this. It was that good. 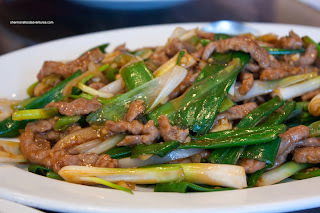 Coming from such a impactful dish, it was almost a letdown with the Shredded Beef with Green Onion. Nothing particularly wrong with it other than its normalcy. This is a typical combination found in Chi nese cooking where the caramelized ingredients create a aromatic sweetness. The beef was so tender (from marinating) that I initially mistakened it for pork. This was well-executed, if not quite standard. Arriving in a big hot pot, the 3 Spice Chicken looked absolutely delicious. Sometimes known as 3 Cup Chicken, it named as such because there is usually 3 cups of main ingredients (such as rice wine, soy and sesame oil). 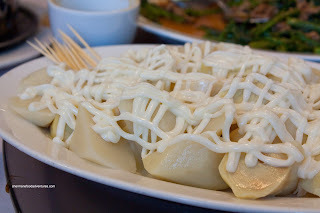 A common menu item at Taiwanese restaurants, I usually find it oily and unsatisfying due to the lack of chicken meat. Not here though. The pieces of chicken were meaty, tender and freakin' tasty. All the flavours had melded together and penetrated each piece of meat. There was a good balance between tart, salty, sweet and aromatic. Furthermore, it was not as greasy as other versions I've come across. Very well done. Normally, there are very few Chinese dishes that confuse me anymore since I've practically tried everything. However, when the Cold Bamboo Shoots with Japanese Mayo arrived, I didn't know what to think. I've never seen it prepared in this fashion. Now if you think of bamboo shoots, the first thing that comes to mind is funky vegetable gaminess. Relax, it was actually very bland. This dish was more about texture (think of really large white asparagus) than anything else since the mayo was very mild and sweet. 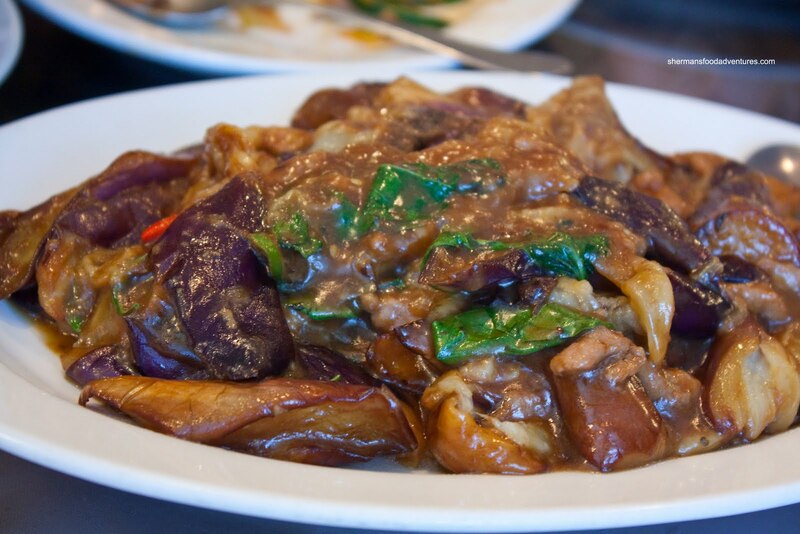 Going from something that had some bite to a mostly mushy dish was the Eggplant with Shredded Pork. Another mildly flavoured offering, the eggplant was predictably soft. Yet, we could still discern individual pieces other than the middle of the plate. It was somewhat sweet with some savoury elements. Solid, if not unremarkable. 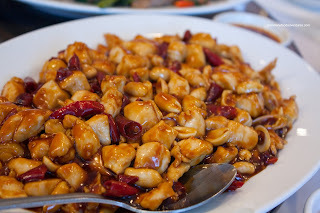 Up until this point of the meal, we didn't really get a truly "Szechuan"-type dish. The Diced Chicken & Peanuts with Chili Peppers took care of that issue. Visually appealing and even more so taste-wise, this needed rice. The chicken was tender despite the small dice while the chili peppers added the necessary heat. Loved the peanuts, it added a nice crunch and nuttiness. Good wok heat as well since the flavours were intense and properly caramelized. When the Prawns & Mayo with Pineapple arrived at the table, Karl gave me a look. He's not big fan of fried prawns and sweet mayo. Honestly, me neither. In actuality, I do enjoy it; but not beyond 2 pieces (I do like the one with walnuts more). After that, it gets heavy and kinda gross. 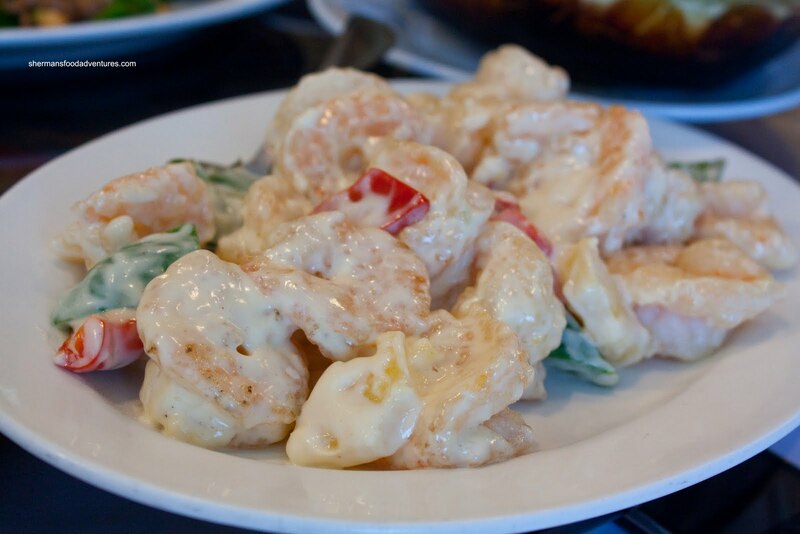 In this case, the prawns were perfectly cold-water crunchy while the mayo was sweet to being with and became more sweet from the pineapples. 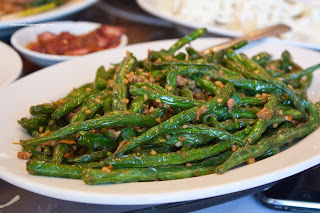 As if we needed more food, it just kept coming with the String Beans with Minced Pork next. I found that the beans were slightly overfried which made them dry and slightly shriveled up. I did enjoy the plethora of garlic which added another flavour dimension to the slight spiciness. After this, we headed back towards another classic Taiwanese dish/snack in the Salty Peppery Chicken. These "chicken" nuggets are coated in salt and pepper then deep fried. I found them to be juicy on the inside while lightly crispy on the outside. In terms of flavour, it was more salty than peppery though. If they had added a bit more pepper, it would've been quite good. 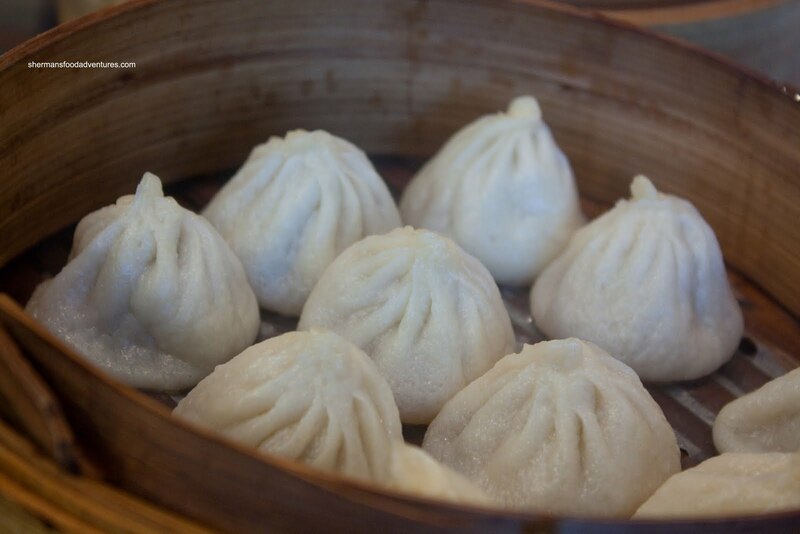 We shifted gears once again towards Shanghainese food with the Xiao Long Bao. We went in with reasonable expectations on this one since this is not their specialty. As expected the dumpling skin was relatively thick, especially at the top where the dough twists. I found the meat inside to be tender in texture; yet slightly bland to the taste. More meat flavour and more seasoning was needed. There was a modest amount of soup inside and it could've benefited from more ginger. It was mostly one note in the flavour department. Again, it was decent for this type of restaurant. Despite what you think, this was not the end of the meal. Instead, there was a "soup" that was yet to arrive. Why were we getting a soup at the end of the meal? Well, the Chicken with Sesame Oil & Wine in Hot Pot apparently takes a while to prepare, so it ended up as our last item. If the pork chops was my favourite dish, then this was a close second. 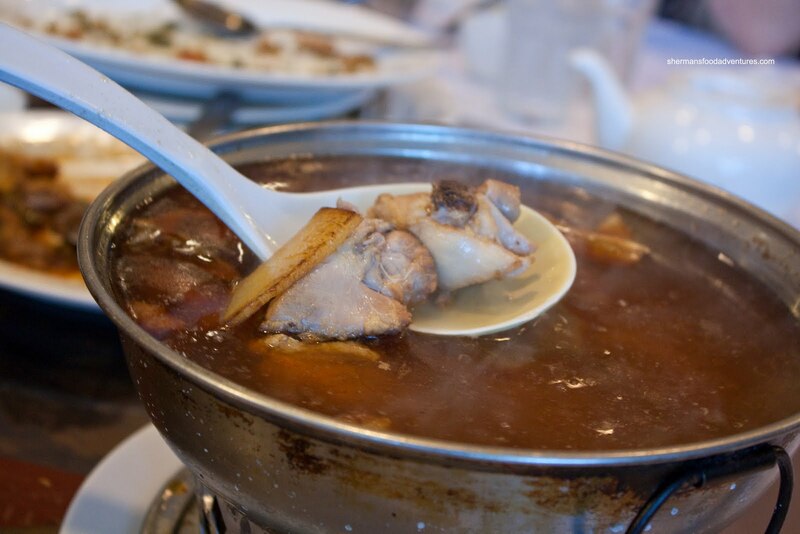 The broth was so intense and had so much depth, it would be hard to have more than one bowl. I could taste the natural sweetness of chicken, the aromatic essence of sesame oil and only a bit of the wine. Since the flavour was so intense, I can only speculate that there was MSG in this. No matter, I enjoyed it very much. To boot, the chicken was actually decently tender. All throughout our meal, there was a large lineup outside w aiting for tables in this tiny restaurant. I can see why. For the massive amount of dishes we did try, most were solid and some were fantastic. That is quite the feat when the restaurant was at capacity since the kitchen was probably nuts. Maintaining that level of quality and execution is challenging. I really enjoyed my meal and this has been one of the most Taiwanese/Szechuan meals I've had in a long time. It didn't hurt that I had good company too. I'm so glad I signed up for this dinner. It reaffirmed why I blog in the first place. Enjoying good food with like-minded individuals, despite any perceived differences. Life is too short to be petty. @Kevin You know that would be unclassy to rave about that!